Monument erected by the C.R.I.B.A. As an 18 year old I attended Victoria Junior College in Texas. An Army recruiter drove 28 miles from Cuero (KWEH ro) to Victoria and came to see me. He had visited with me many times on previous occasions to try to get me to enlist. I told him I would volunteer when school was out. I wanted to finish my freshman year. He said " The men at the draft board showed me the call-up list and your name was on it." He said if I would volunteer, he would guarantee that I could finish this first year of college. After the semester was over, in three or four days I got a notice to report to San Antonio. I reported and was inducted into the Army and went to basic training at Camp Maxie near Paris, Texas. I was with my classmates in basic training. It was an enjoyable experience, but after that it was downhill all the way. After training they put me in ASTP (Army Specialized Training Program). I went back to college at Kilgore in that program. I stayed there one semester. Then we were assigned to a company. A company in the Army is composed of 200 men. Ours was Company E. We would sing a song and at the end of the song we would shout "EEE! EEE!" Then we went on to another training camp. After basic training they gave us a test. There was a rumor it was about biology. I knew a lot of biology but I thought to myself, "I don't want to be a biologist, I want to be a petroleum engineer. ", so I deliberately flunked the test. Biggest mistake I ever made. It nearly cost me my life. The people who did well on the test were sent to school to become doctors because the Army was short on doctors at the time. The rest of us were given a gun and sent to the battlefield. Years later my wife, Patsy, mentioned a Dr. Torno who was a physician at Pasadena Memorial Hospital. He had been with us in basic training. On Thanksgiving day 1944 we had a Thanksgiving dinner on the front line. The field kitchen crew had set up two tables in a clearing in the forest. There was a big bowl of turkey and dressing and a smaller bowl of other fixings. After we ate they put the tables back at the edge of the forest. Several days later the Germans starting shooting a cannon out of a small tank. The first shot hit the big bowl that had been left on the table, and the second shot hit the other bowl. The enemy line was separated from ours by a distance of about 150 yards. 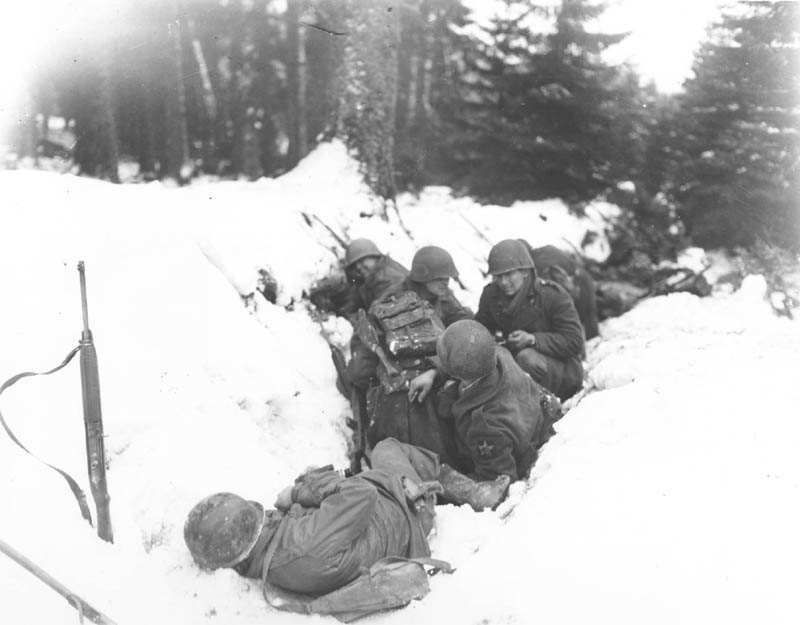 The Germans had retreated from their front line during this time until the Battle of the Bulge started on December 16th. The time I was at that front line was during a lull in the battle. One day I said, "I'm going to look around a bit". So I got out of the foxhole and hid behind a bush. I didn't see anything so I stood up and walked up and down the trench. Then it happened. I saw movement on the other side and a German sniper fired a shot. The bullet pentrated my helmet and I felt it graze my hair. I told the guys in the trench, "Don't look at me or talk to me because I'm going to play dead until it's too dark for the sniper to see me." Then I either passed out or went to sleep. When I woke up it was mid-morning the next day. I crawled backward . When I dropped in the foxhole I knew my feet were frozen because I had no feeling from the knees down on both legs. My left hand was also frozen, but I could move my trigger finger. I shot left-handed because I don't have vision in my right eye. The two guys were gone and so was my rifle and my helmet. In fact there was no one in any of the foxholes. They had evacuated the company from the front lines. I waited all day. Then two medics appeared with a stretcher. One of them said, "The soldiers reported a dead GI up here and we have come to get the body." I said, "I must be the body because there's no one here but me." My buddies had thought I was dead and had taken my helmet and rifle. The medics took off my shoes and pricked my toes with a needle, but I didn't feel anything at all. I was suffering from frostbite. (In the Army at that time they called it "trench foot".) They told me to get on the stretcher. I said, "I can walk." They said," If you don't get on this stretcher, you're going to lose both your feet." Naturally, I got on the stretcher. I said, "Where is everyone?" The medics said the others were pulled out because they had run out of ammunition. There was a strike at the munitions plant in the United States and they were not producing the ammunition we needed. How could such a thing happen! After that I became an anti-union person. All these events occurred one or two days before the Battle of the Bulge began. It began in the very place where I had been. One man I talked to later said he had escaped when the battle began because he had gone to the rear line for something. Everyone in his company had been killed or taken prisoner. The medics took me in a truck to a hospital in a large city which I assumed to be Paris, France. I'm not sure what city it was. They were carrying me on a stretcher and we came to an intersection. Two young girls came by and oohed and ahhed over the soldier on the stretcher. The medics put me on a train. From there we took a ferry to England. I stayed in the hospital there for quite a while. After my release from the hospital I was walking along the coast of the village and saw a a small ship docked there. Two more soldiers came by. I asked them, "What ship is that? Where's it going?" They said, "We guess it's going back to the U.S."
I got on the ship without talking to anyone. I fell asleep and when I woke up we were out on the ocean. Sure enough, it was going to the U.S. because we landed in New York. From the ship we went to another Army hospital in New York. They were making up a USO tour of New York and asked me if I wanted to see the city. I said, "No, I want to go home." They put me on a train for a hospital in Carson, Colorado. There were two girls sitting behind me. One of them started drawing a picture of my face. I received an honorable discharge on July 14, 1945 and returned home to Cuero, Texas. My days in Company G in the 394th Infantry Division, which was a part of the 99th Division, were over. LOVE it. I love WWII, the history, not all the suffering that they had to go through, but I have to say, if there is going to be a WWIII, wait until I'm long gone dead please!GO 101st airborne!!! they were the ones who really helped us win the war on Nazi Germany. if it weren't for them, we would be under rule (or dead) under the Axis Powers. PRAISE THE LORD! GOD LOVES US ALL. AMEN. just someone who loves history! 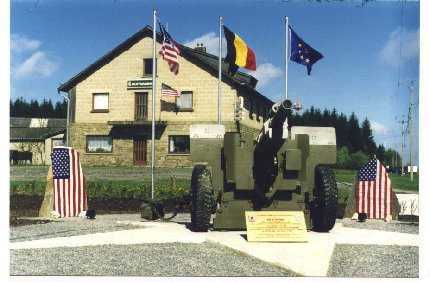 My grandfather was 2nd batt 394th inf 99th div co.g also. But I haven't got him to talk about it too much. good story. 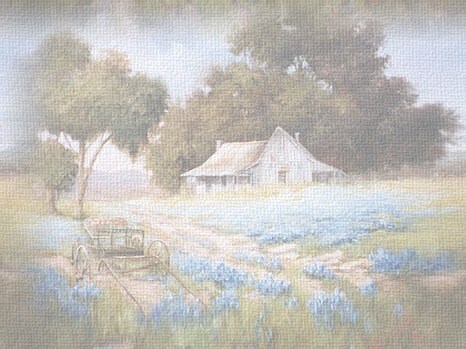 my great grandfather owned the land that was camp maxie. the government came in and just claimed it on day. his family fad about 3 days to up and move. it was very nice. i love history but till how much ever of websites i have visited about are quite long and boring which was making me hate history a bit .